Cancelled by ITV in 2007, the series was brought to a close in 2008 with the final episode ("All Clear") taking place on VE Day. But high ratings for the final series and fan complaints over the cancellation caused the network to reconsider its decision, the result being the commissioning of three new episodes that take place during the summer of 1945. In this Sunday's episode, "The Russian House", the war is over in Europe, the dawn of a new era at hand, and much has changed — for Samantha "Sam" Stewart (Honeysuckle Weeks) and Paul Milner (Anthony Howell) at least. Detective Chief Superintendent Christopher Foyle's (Michael Kitchen) retirement ambitions have hit another snag, and he's still bound to his old job and a new case. A Russian POW is on the run, an eminent resident is dead, and Milner, as the new Detective Inspector in the Brighton police force and eager to be out of Foyle's shadow, is on the case. Milner has his eye on an obvious suspect in the murder, but Foyle is taking a more circumspect view of the case. Why is the War Office so intent on tracking down one particular Russian POW anyway? The answer will put Foyle in grave danger like never before, and shed a searing light on secrets of the British government. Foyle's War is, without question (at least in our minds), one of the finest examples of television series crime drama ever produced. Those who have seen previous episodes will be thrilled to discover that the quality of writing and production are as high as ever in these new episodes, and will welcome Michael Kitchen as DCI Christopher Foyle back into their homes; newcomers will be scrambling to see how it all began. (MBN note: Acorn Media provided us with a complimentary set of the sixth series DVDs to preview.) 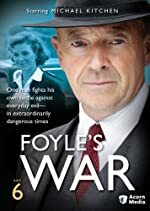 DVD sets of the previous series are available on our website Mysteries on TV: Foyle's War, as individual sets and as the complete set, Foyle's War: From Dunkirk to VE-Day. The sixth series will be available on DVD on June 1st, and may be pre-ordered. 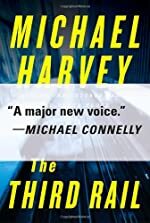 Chicago private investigator Michael Kelly is drawn into a deadly cat-and-mouse game when an unknown killer inexplicably includes him in his plans in The Third Rail, the third mystery in this series by Michael Harvey. A few days ago we gave an update on how The Hollywood Reporter was sizing up the new fall season (with our own emphasis on crime dramas). Today Variety is providing their view on which pilots have a chance to be picked up by the networks. NBC, with the most open slots to fill, is said to be adding staff for its remake of The Rockford Files, a good sign that it's a go. Also looking good are The Chase, about federal marshals tracking down fugitives, the conspiracy thriller The Event, and The Cape, about a former cop who becomes a masked superhero to clear his name. Over at CBS, the remake of Hawaii Five-O seems to be a sure thing. Other than that, the only other show mentioned is the Criminal Minds spin-off, which may be considered as a mid-season replacement. ABC seems likely to pick up the Dana Delaney medical examiner series Body of Evidence and the cop show 187 Detroit. Leading Fox crime drama pilots include Breakout Kings, about a team of ex-cons who team up with US marshals, the Chicago-based police drama Ride-Along, and the legal thriller Pleading Guilty, based on the Scott Turow Kindle County novels. The con man drama Midland, also under consideration, is thought to be more appropriate for its sister network, FX. Finally, the CW is said to be sure to go with the remake of La Femme Nikita. The network announcements for the 2010 fall season are expected in mid-May. Windows Vista/XP (185 MB download). Return to 221 Baker St. and solve 16 new cases of forgery, kidnapping, murder, and more! Play over 40 levels of hidden object and find the difference gameplay featuring 50 mind-bending puzzles and 60 stunning locations in Victorian London. 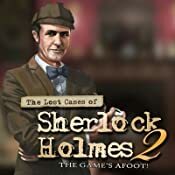 Play as Sherlock Holmes and interact with over 100 characters, including Watson, Mycroft, and Inspector Lestrade. Windows Vista/XP (231 MB download). 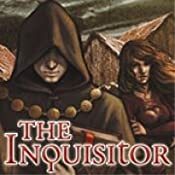 A list of the top 15 mystery hardcover bestsellers for the week ending April 30, 2010 has been posted on the Hidden Staircase Mystery Books website. Harlan Coben's non-series thriller Caught remains for the fourth week at the top of the list with one new title in the top 15 and another moving up from just off the list last week. 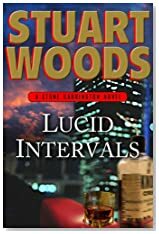 Moving up 12 places into 8th position is Lucid Intervals, the 18th thriller to feature New York City attorney Stone Barrington by Stuart Woods. It seems like just another quiet night at Elaine's. Stone and his former cop partner Dino are enjoying their drinks when in walks former client and all-around sad sack Herbie Fisher … with a briefcase full of cash and in need of a lawyer. But while he’s trying to fend off Herbie, Stone is propositioned by another potential client, this one a bit more welcome. A beautiful MI6 agent, Felicity Devonshire has a missing persons case she needs solved—and she knows from experience how very useful Stone can be. Stone’s investigation takes him into the posh world of embassy soirees and titled privilege, where high society meets government intrigue. And when trouble follows him from his luxurious Manhattan brownstone to his tranquil summer home in Maine, Stone has to decide what to do with the explosive information he’s uncovered. 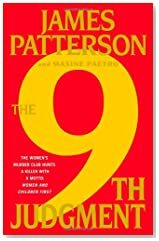 Just one spot lower, in, appropriately enough, 9th position is the 9th mystery in the Women's Murder Club series, The 9th Judgment by James Patterson. Lindsay spends every waking hour working with her partner, Rich -- and her desire for him threatens to tear apart both her engagement and the Women's Murder Club. Before Lindsay and her friends can piece together either case, one of the killers forces Lindsay to put her own life on the line -- but is it enough to save the city? Several people are tweeting the winners of the 2010 Edgar Awards tonight (thank you, especially @sarahw), which are awarded annually by the Mystery Writers of America to authors of distinguished work in various categories of the genre. A complete list of all winners in all categories will be posted to the MWA website (probably tomorrow). 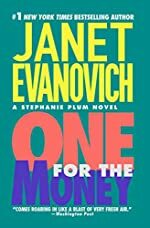 In a press release today, Lionsgate announced the studio had acquired the US distribution rights to the film adaptation of One for the Money, the first mystery in the bestselling Stephanie Plum series by Janet Evanovich. Katherine Heigl will star as the New Jersey bounty hunter. Mike Paseornek, Lionsgate President of Motion Picture Production, who will oversee the production for Lionsgate, said, "We're very excited to join our friends at Lakeshore and Sidney Kimmel Entertainment in bringing One for the Money to the big screen. And we're delighted to be working again with Katherine Heigl, who is the perfect actress to play Janet Evanovich's smart, gutsy and funny heroine." Julie Ann Robinson is set to direct, with production beginning in July. About One for the Money (from the publisher): Welcome to Trenton, New Jersey, home to wiseguys, average Joes, and Stephanie Plum, who sports a big attitude and even bigger money problems (since losing her job as a lingerie buyer for a department store). Stephanie needs cash -- fast -- but times are tough, and soon she's forced to turn to the last resort of the truly desperate: family. Stephanie lands a gig at her sleazy cousin Vinnie's bail bonding company. She's got no experience. But that doesn't matter. Neither does the fact that the bail jumper in question is local vice cop Joe Morelli. From the time he first looked up her dress to the time he first got into her pants to the time Steph hit him with her father's Buick, M-o-r-e-l-l-i has spelled t-r-o-u-b-l-e. And now the hot guy is in hot water -- wanted for murder. Abject poverty is a great motivator for learning new skills, but being trained in the school of hard knocks by people like psycho prizefighter Benito Ramirez isn't. Still, if Stephanie can nab Morelli in a week, she'll make a cool ten grand. All she has to do is become an expert bounty hunter overnight -- and keep herself from getting killed before she gets her man. Pogo.com last week announced the launch of an online version of CLUE: Secrets & Spies, based on Hasbro's popular board game of the same name. If you are interested in checking out the game, go to the game website and click on "Play Now." (You'll need a free Pogo.com account to play.) The first few episodes are offered free of charge. CLUE: Secrets & Spies is a strategic, international mystery-spy game. Players, acting as an agent of the Police Operatives Global Organization (P.O.G.O. ), travel to locations around the world tracking down hidden clues and object on a mission to thwart the nefarious plans of Agent Black. The game mystery is divided into a series of discreet and self-contained hour-long "episodes" that offer complex images of five locations that players must closely scrutinize to discover 10 cleverly hidden objects in the background. Upon identifying all 10 objects in the initial location, the player continues through the remaining four locales where the objects become more increasingly difficult to find. Available only at Pogo.com, the game will be regularly updated with new episodes. For information on more CLUE games, including the board version of CLUE: Secrets and Spies, visit our Games of Mystery: Clue Variations webpage. 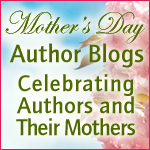 BookReporter.com is celebrating Mother's Day with a series of daily blog posts from mother/daughter writing duos, author moms and their author children; mothers sharing what it was like raising a future author; and authors paying tribute to their moms. Mystery and suspense authors are well represented in this list, with recent posts by P. J. Tracy, the pseudonym used by mother and daughter P. J. and Traci Lambrecht, who write the Grace MacBride "Monkeewrench" series; Lisa Gardner's mom (with Lisa's entertaining editorial comments); Sandra Brown and her son Ryan Brown, who's debut thriller publishes next month; and Mary Higgins Clark "Queen of Suspense" and her daughter Carol Higgins Clark, who "unlock the mystery behind their teamwork." The site is also sponsoring a contest where visitors can enter to win one of fifteen Mother’s Day Gift Basket filled with a selection of 12 books from our 36 featured titles, giving mom a book to read each month and making Mother’s Day truly a yearlong celebration. A variety of gifts are also included in each basket. Vist the BookReporter.com entry page for more details. Masterpiece Mystery! returns this Sunday on PBS with a summer schedule of series that promises to tickle the little gray cells most delightfully! Julia McKenzie is back in the role of Agatha Christie's iconic sleuth Miss Marple, pursuing a series of new crimes and dark occurrences. With a gentle smile and a probing mind, she often finds herself at the center of trouble — a witness to betrayals, poisonings and all manner of mayhem. Knitting needles in hand and a cup of tea always at the ready, Marple quietly earns confidence while uncovering secrets and exposing killers. David Suchet reprises his role as suave detective Hercule Poirot in three new episodes. Whether he's on holiday or simply going about his business near his London home, Poirot finds himself exercising his "little grey cells" by helping police investigate crimes and murders ... whether they ask for his help or not. Kevin Whately returns for a third season as Inspector Lewis in five new episodes. Once again joined by Laurence Fox as Lewis' young partner DS Hathaway, the detectives continue solving cases in the seemingly perfect academic haven of Oxford. 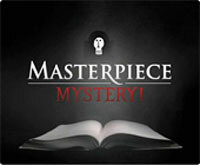 Check your local listings to confirm dates and times for Masterpiece Mystery! on PBS. A well-established member of New Orleans society, and host to the community’s most spectacular galas, Madame Lalaurie was known as a sweet mannered, gracious and captivating woman … until whispers of secrets beyond human belief grew louder and louder. As one of the oldest and most multi-faceted cities in the United States, New Orleans is filled with tales similar to the LaLaurie’s. But the gruesome horror of this particular chain of events is so dreadful, it stains the city’s memory to this very day. Sinister thrills await in this gorgeously dark and unsettling telling of a real-life ghost story from New Orleans’ shadowy history. Free trapped spirits, cast spells and unlock fragments hidden in the paranormal world to reveal the story of a misguided voodoo queen. 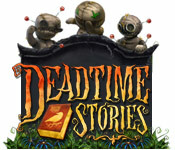 Deadtime Stories may be downloaded and purchased for $6.99 with a Big Fish Game Club membership. A demonstration version (104.82 MB) may be downloaded and played for free for one hour. 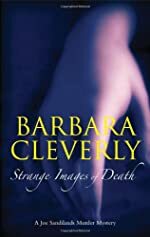 Scotland Yard Detective Joe Sandilands is on leave with plans to vacation in the south of France, but is sidetracked when a request for help comes from an old friend living in a chateau near his destination in Strange Images of Death, the eighth mystery in this series by Barbara Cleverly. First Clues: Mysteries for Kids, your source for information on over 100 mystery series for children and young adults, where each series is conveniently listed under four different age categories (New Sleuths, ages 4 to 6; Future Sleuths, ages 7 to 9; Sleuths in Training, ages 10 to 12; and Apprentice Sleuths, ages 13 and older), is pleased to announce new Hardy Boys and/or Nancy Drew series books scheduled for publication during May 2010. Nancy and her classmates are entering a model-building contest to win the prize of a lifetime -- a chance to spend a week in northern New Mexico! But before Nancy, Bess, and George can even enter their pueblo model, it's been destroyed! Plus Hannah's been acting very strange recently. Something sinister is definitely afoot. Have the girls angered the Taos Indian spirits by building the model, or is the threat something closer to home? The 26th mystery in this series featuring a young Nancy Drew is recommended for readers aged 7 to 9. The Hardy Boys are on a chilling mission! They've been sent out on a camping trip in the woods where children have suddenly disappeared. Every time a child disappears, the word "LOST" has materialized outside their tent ... and they are never heard from again. The Hardy Boys think they've got things covered; they're ATAC agents after all. But when an "L" appears outside their own tent on their first night in the woods, things soon take a turn for the creepy. This first book in the "Lost Mystery Trilogy" is recommended for readers aged 10 and older. Players take on the roll of Angelina, a detective that is trying to track down an illusive jewel thief. The thief has stolen jewels from all over the world and Angelina has tracked the thief down to an exclusive Millionaire’s Caribbean cruise. The King of Diamonds, as the thief is known, hits the rich and famous as they are cruising around the world. The exclusive jewels go missing and are replaced by a playing card left by the King of Diamonds. Use your hidden object skills to discover helpful hints needed to track down and catch the thief! 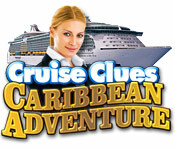 Cruise Clues: Caribbean Adventure may be downloaded and purchased for $6.99 with a Big Fish Game Club membership. A demonstration version (128.29 MB) may be downloaded and played for free for one hour. Many news organizations (e.g. 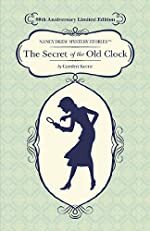 USA Today) are reporting on the 80th anniversary of the publication of the first Nancy Drew mystery, The Secret of the Old Clock by the pseudonymous Carolyn Keene, on April 28th, 1930. Grosset & Dunlap is celebrating by producing a special 80th Anniversary edition of the book (cover depicted to the right). The series was originally created by Edward Stratemeyer, who was also the creative force behind The Hardy Boys among other series. Nancy Drew has since been featured in hundreds of books, dozens of games, and several films. She is an industry unto herself! Fifty-six books in the original series were published between 1930 and 1979, with the first 34 substantially updated and/or rewritten starting in 1959. An additional 119 titles (part of the so-called "Mystery Stories") followed until 2003. But in between there were also 124 books in the "Nancy Drew Files" series and 69 books in the "Notebooks" series, which featured a young Nancy Drew. This latter series was reimagined as the current Nancy Drew and the Clue Crew mysteries for young readers, while the teenaged Nancy Drew continues to solve crimes in the All New Girl Detective series. Nancy Drew is also featured in a separate series of graphic novels! But for those who want to see how it all began, The Secret of the Old Clock is the place to start. Happy Anniversary, Nancy Drew! About The Secret of the Old Clock (from the publisher): When the Topham family inherits all of Josiah Crowley's fortune, something isn't right about the whole affair. Josiah promised other friends and relatives that they would inherit. In Nancy's first case, she searches for a hidden will in order to help restore the inheritances to the rightful heirs. Being locked in a closet by robbers and a narrow escape with an old clock lead to Nancy solving this baffling mystery! Deadline is reporting that FX Networks has picked up the pilot for Outlaw Country, a crime thriller / family drama set in Nashville. Josh Goldin (Darkman) and Los Angeles Times entertainment writer Rachel Abramowitz wrote the screenplay for the pilot, which has been completed, with production expected to begin in the fall; it is in consideration for a series order by the network. Shooter Jennings, son of the late country star Waylon Jennings, is credited as an executive consultant and music supervisor. 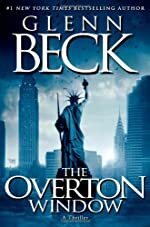 A week or so ago, syndicated radio and television host Glenn Beck asked readers to vote for one of four choices to be used as the cover for his upcoming political thriller, The Overton Window. The winner, announced today and shown to the right, depicts the Statue of Liberty as a bearded man with a staff in addition to the familiar torch. Available for pre-order now, the scheduled publication date is June 15th, 2010. About The Overton Window (from the publisher): There is a powerful technique called the Overton Window that can shape our lives, our laws and our future. It works by manipulating public perception so that ideas previously thought of as radical begin to seem acceptable over time. Move the Window and you change the debate. Change the debate and you change the country. For Noah Gardner, a twenty something public relations executive, it's safe to say that political theory is the furthest thing from his mind. Smart, single, handsome and insulated from the world's problems by the wealth and power of his father, Noah is far more concerned about the future of his social life than the future of his country. But all of that changes when Noah meets Molly Ross, a woman who is consumed by the knowledge that the America we know is about to be lost forever. She and her group of patriots have vowed to remember the past and fight for the future—but Noah, convinced they're just a bunch of freaky conspiracy-theorists, isn't interested in lending his considerable skills to their cause. An unprecedented attack on U.S. soil shakes the country to the core and puts into motion a frightening plan, decades in the making, to transform America and demonize all those who stand in the way. Amidst the chaos, many don't know the difference between conspiracy theory and conspiracy fact—or, more importantly, which side to fight for. The nominees for the 2010 David G. Sasher, Sr. Award (the "David)" for the best mystery published during 2009 were announced today by Deadly Ink. The winner will be announced at an awards banquet during the Deadly Ink conference in June.